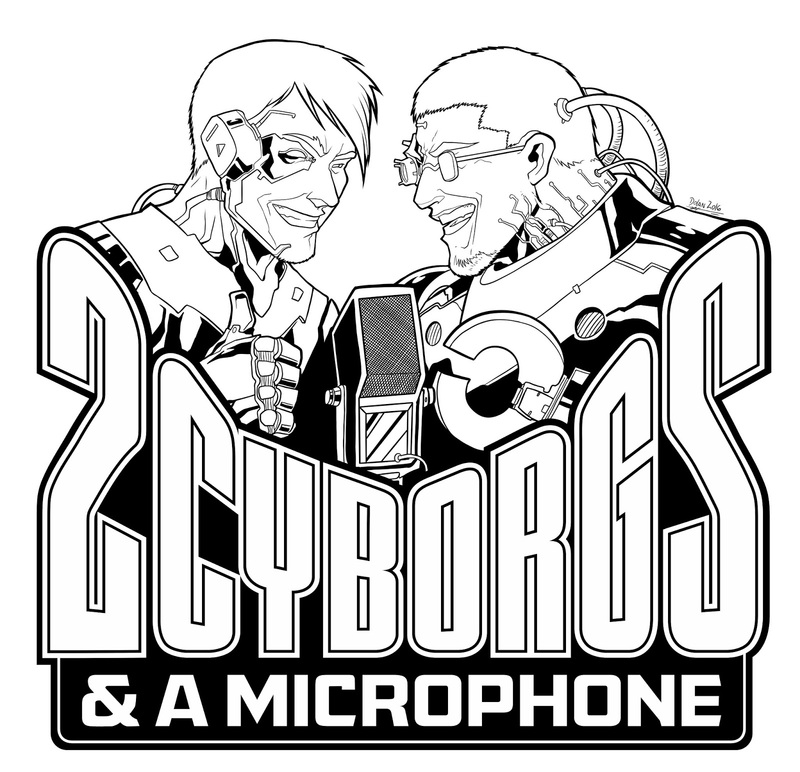 Naturally, another episode of Two Cyborgs and a Microphone was published. This episode was about tDCS units which was great because I've built a few. The first was a fixed 2mA device and the second was adjustable from 0 to 2mA. I mentioned these in the show but the links are right there for your convenience. As I mention in the show, there was a little mishap when I used the tDCS units, due to my own error, so I'm a little gunshy. 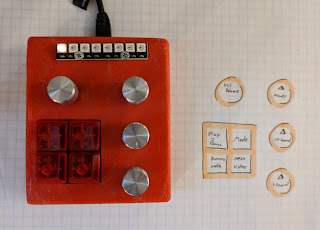 For the Clockwork Theremin, pseudo code and Arduino code were written. The code, at this point, was only 150 lines long and it was spaced generously so it would be safe to say it was a simple program. It was never intended to be complex, in fact, one of the virtues of this project was the simplicity while outwardly it appeared busy. Construction of the gears was started. The two smallest sizes printed on paper in actual size then meticulously cut out. This was slow work that was best done with mindless television going. The printed pieces were taken to the hackspace where the backs were sprayed with 3M Super77 adhesive. 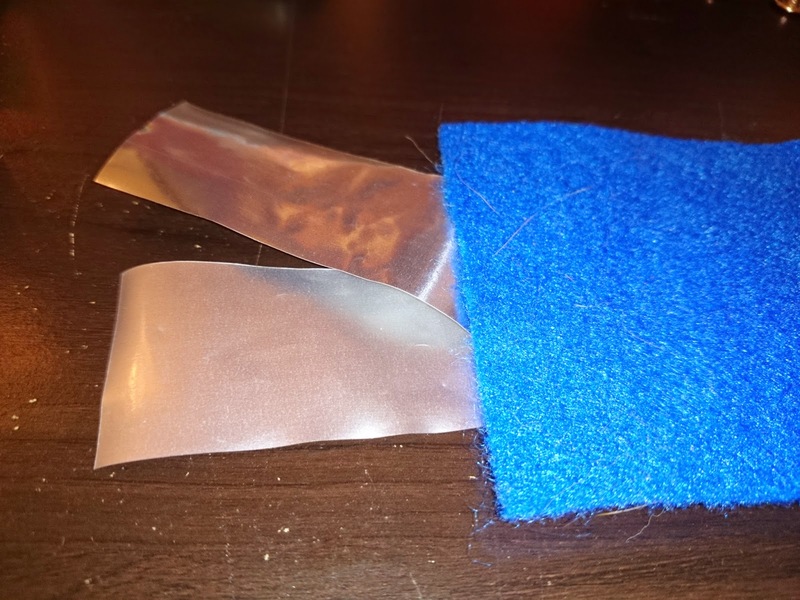 The glue was allowed to set then the paper was applied to 1/4" plastic sheets. 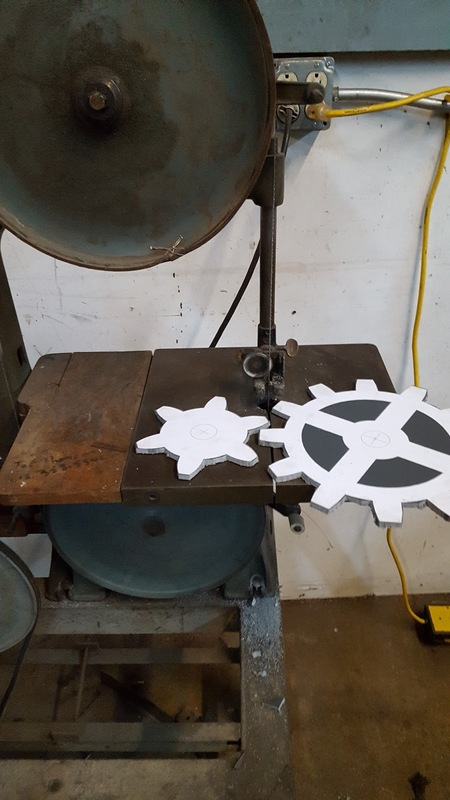 A dangerous old bandsaw was used to cut out the gear teeth. Only rough cuts were made. After the initial work with the bandsaw, sandpaper was used to smooth the edges. In the picture below it is easy to see the rough cut between the teeth on the left compared to the smooth edges between the teeth on the right. 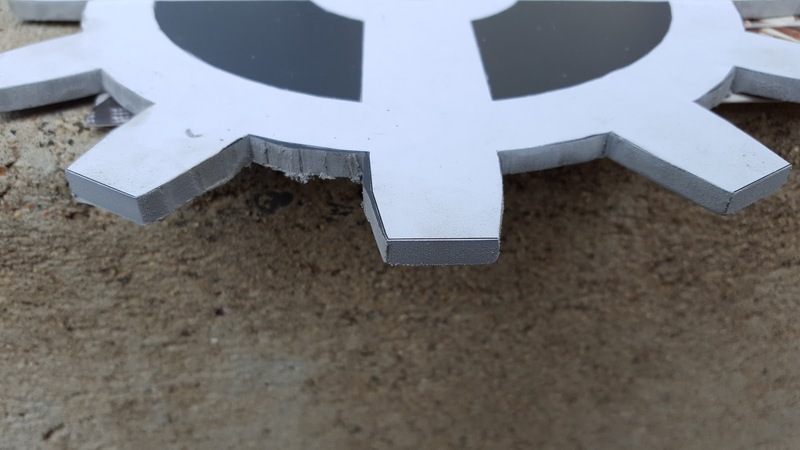 Straight edges were maintained by wrapping a piece of sandpaper over some scrap wood and using a sawing motion to remove the unwanted plastic. 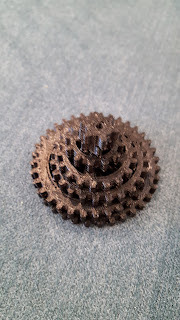 After the technique was refined on the small gears the largest ones were printed in real size. 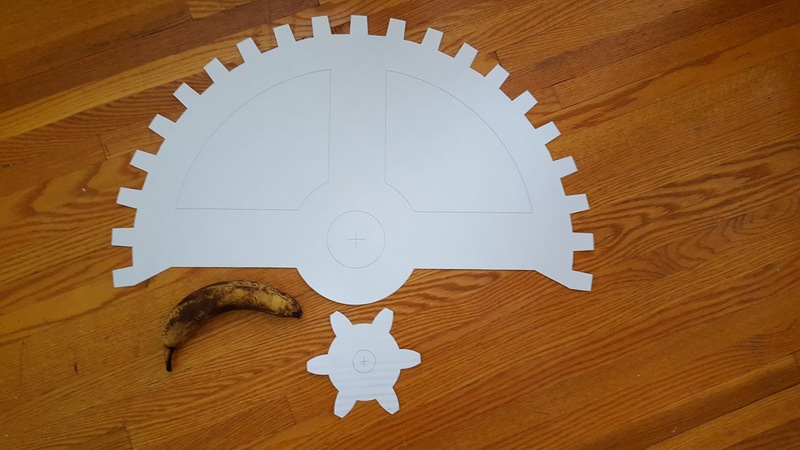 They can be seen below with the smallest diameter and the largest diameter, banana for scale. 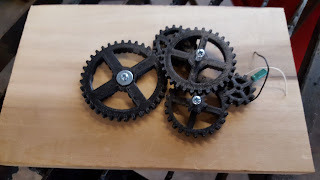 All the work going into the gears made it clear that they would not be done quickly. Since 3D models already existed, spokes and everything, they were printed. 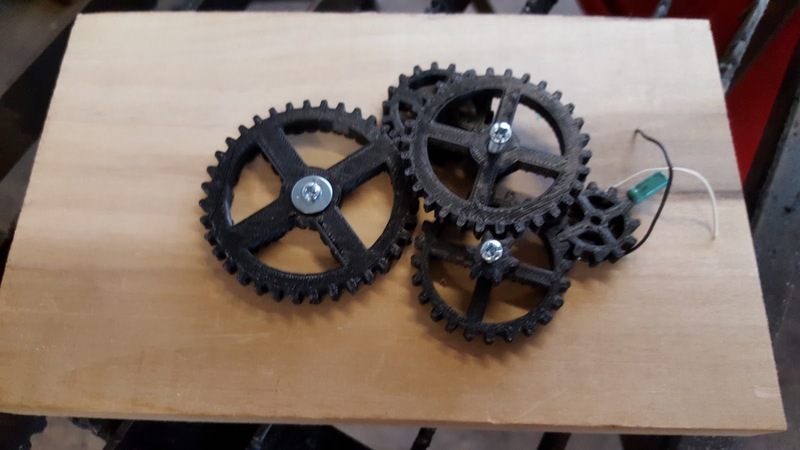 The idea was to make a miniature version that would make a cute gift for my young cousin and allow some experimentation with the code while full-size gears were being produced. The small gears were mounted on a wooden plank and a hole was drilled underneath the driven gear. A small electric motor was mounted in the hole. The final and largest gear will eventually have to be mounted to a potentiometer to get servo feedback. Another important component of the project was a sine wave frequency generator. Inexpensive version were sold as "learn to solder" kits so one was ordered from Amazon. It was a surprise to see how well made the PCB was when it arrived. 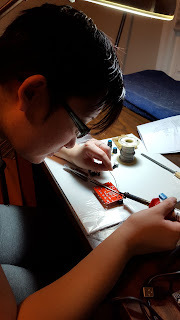 The kit was assembled by my girlfriend as way to start teaching soldering. She did remarkably well and made very neat work. 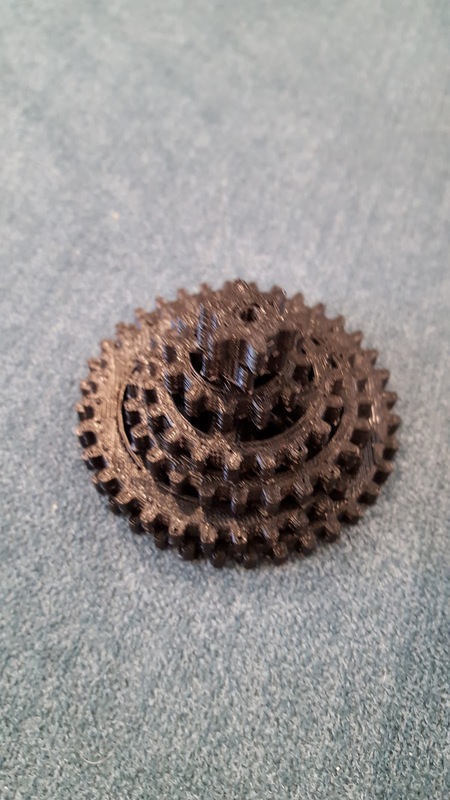 While playing around with the 3D printed gears it became apparent that the smallest gear didn't mesh well. It had six teeth but its diameter didn't warrant so few teeth. Another couple versions were produced with the same diameter, one had seven teeth and one had eight teeth. Four of each size were printed on paper. Cutting out each tooth on paper was laborious and boring. 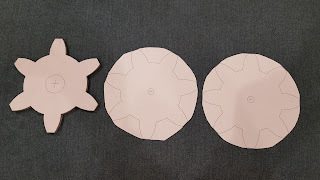 It was also obvious that the power tools would not be slowed down if they had to cut paper as well so gears were cut out of paper by simply cutting out the outer circumference. 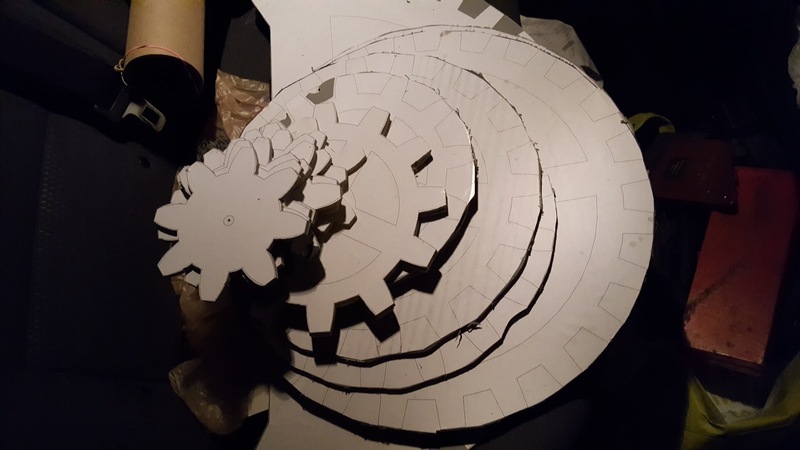 Many of the large gears were roughly cut out of plastic. The second largest gear, over 500mm in diameter, would not fit on the plastic sheets. The largest gear, over 600mm in diameter, only fit because it was designed as a half gear.